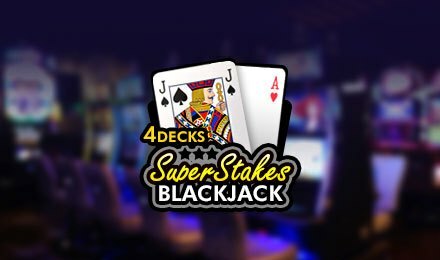 At Wicked Jackpots, you can enjoy a round of blackjack on the new game, Super Stakes Blackjack. This game which has been created by Section 8, comes with customised settings. Enjoy the game the way you prefer. Turn on the sounds, select your table colours and opt for quick play! Be all set to bust the dealer with a hand of 21! To start the game, you have to place your stake. Throughout the game, the dealer will shuffle from 4 decks of 52 playing cards. Click on ‘Deal’ after having placed your stake, and the game will kick off instantly! You can win different prizes on this game- it all depends on the outcomes! Bet Levels: No Bet Levels available on this game. Amount of Paylines Selection: There are no lines on this game. Coin Values: The chips vary from 1 to 500. Click on the chips to increase your stake and click on Clear, to wipe off the bet. The minimum stake is £10 and the top bet is £3,000.